The New York International Children’s Film Festival begins this weekend, and two Japanese films are in the lineup: Case of Hana and Alice and the opening-night film, The Boy and the Beast. This special preview screening presents the latest work by Mamoru Hosoda, whose Summer Wars kicked of NYICFF in 2010 and Wolf Children won the Audience Award in 2013. The screenings of the Japanese films is presented with support from the Japan-United States Friendship Commission, which supports research, education, public affairs and exchange with Japan through educational, cultural, and intellectual exchange. 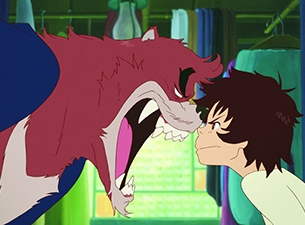 The Boy and the Beast by Mamoru Hosoda. Photo courtesy NYICFF. The story of The Boy and the Beast is set around Kyuta, a young orphan living on the streets of Shibuya, and Kumatetsu, a gruff, rough-around-the-edges warrior beast who’s been searching for the perfect apprentice. Despite their constant bickering, they begin training together and slowly form a makeshift family in this fantastic world of beasts. When a deep darkness threatens to throw the human and beast worlds into chaos, the strong bond between the unlikely pair is put to the test in a final, epic showdown. Can they work together to combine their strength and courage? The screening is presented by Funimation Films in Japanese with English subtitles. The Boy and the Beast opens nationwide on March 4. Case of Hana and Alice by Shunji Iwai. Photo courtesy of NYICFF. 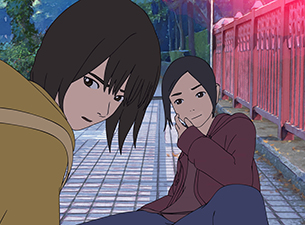 Director Shunji Iwai’s first animated feature, Case of Hana and Alice defies genres by combining them: Part buddy-comedy, part detective story, all wrapped up in a charming coming-of-age tale. Moonstruck Alice is new to a school that she soon discovers is consumed with the mystery of a missing classmate. Her path to make sense of it all leads her right back to her reclusive neighbor, Hana, and the two quickly bond over their desire to close the case. A silly and slapdash investigation ensues, sending the girls all over the city and into the lives of a carousel of quirky characters. As the mysteries unfold, so does a touching friendship between the girls, portrayed with as much authenticity as the photorealistic animation that accompanies it. The New York premiere is presented in Japanese with English subtitles. Sunday, February 28 at 1:30 p.m.
Saturday, March 12 at 6:00 p.m.
To purchase tickets, please visit NIYCFF’s website. The final screening of Case of Hana and Alice are SOLD OUT, but you can be added to the wait list by arriving at the venue one hour prior to the scheduled start. NYICFF may add more tickets or additional screenings throughout the run of the festival, so check NYICFF’s website frequently.